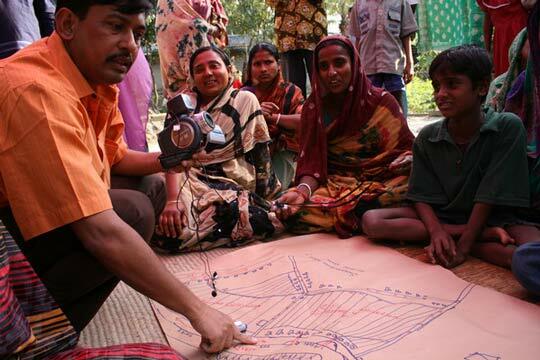 The Action Research on Community Adaptation in Bangladesh (ARCAB) project aims to follow communities at 20 vulnerable sites in Bangladesh as they adapt to floods, droughts, cyclones and sea level rise. The ARCAB project plans to report on these communities for the next 50 years or more. Climate change is likely to hit first and hardest among the poorest and most vulnerable communities in the poorest and most vulnerable developing countries. These communities struggle to cope with climate hazards which are being compounded by climate change. ARCAB aims to identify communities at risk — starting in Bangladesh — and help them to build their adaptive capacity. We focus on Bangladesh both because its large, poor population faces multiple dangers, and because it has led the world in addressing climate change through community-based adaptation; Bangladesh can teach other developing nations the next steps. The ordinary one-to five-year funding cycle doesn’t allow an effective response to climate change impacts, which unfold unpredictably over 50 or 100 years. This project takes the long view, planning activities that set the stage for decades of work. ARCAB's programme of iterative 'action-research' — learning, applying the lessons, and learning more — is designed to track the long and uncertain course of climate change. Adapting to climate change requires learning by doing — delivering both impacts and definitive knowledge. ARCAB brings together an action-research consortium made up of practitioners, researchers in Bangladesh and international institutions. Reaching the poorest and most vulnerable communities requires strong, trusting relationships that have been developed over time. The only shortcut is to work through intermediaries, such as locally-based NGOs which have already built these relationships. ARCAB’s ‘action partners’ are ActionAid, CARE, Caritas, ChristianAid, Concern, Islamic Relief, OXFAM, Plan International, Practical Action and WaterAid. These NGOs are working with local organisations and communities at 20 vulnerable sites around the Bangladesh. Universities located in different regions across Bangladeshi will be responsible for data collection and fieldwork in the sites located in their region. In addition, national research institutes in Bangladesh will provide expertise in particular sectors such as agriculture or hydrology. International research partners, including IIED, Imperial College London and Columbia University, will help design studies to the highest standards and will provide graduate students to form the front-line corps of researchers. Together, ARCAB's local, national and international partners will seek knowledge and solutions that are applicable worldwide. "We look forward to joining hands with ARCAB as a platform to learn from each other and institute the body of knowledge generated through this collective partnership to critically engage in the community-based adaptation initiatives at both local and global levels." In 2012 ARCAB and partners published Financing Local Adaptation: Ensuring Access for the Climate Vulnerable in Bangladesh. This study provides insights into strategies being piloted in Bangladesh for incorporating adaptation to climate change into planning and budgeting at the local level. It also provides recommendations on how the lessons from these initiatives might be used to create a more mainstreamed and effective approach to allocating funding for local and community-based adaptation.